To my embarrassment, the friand tin that I told myself that I absolutely 100% needed languished in the kitchen cupboard for over a year before I got round to making these. And once I'd made them, I was furious with myself for not having done so earlier - they're so good and so simple! 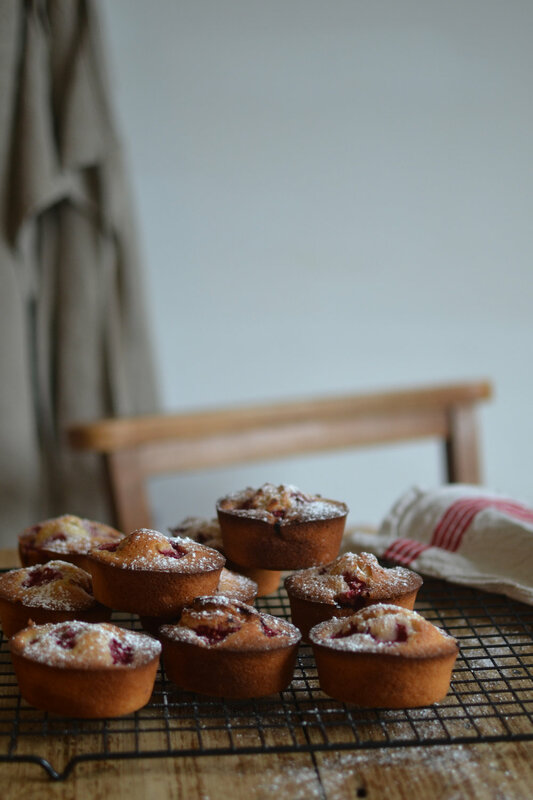 Friands are little French cakes made with egg whites and icing sugar and they're really moist and light as a feather. Plus they look really impressive, as if you're the sort of person that casually whips up a tray of eclairs on a Sunday morning for the family (the best I usually manage is a lemon drizzle loaf cake and I consider that an achievement). Preheat your oven to 200 degrees C and lightly butter your friand tin (I used this one). Put the butter in a small pan and melt over a moderate heat, watching it carefully until it becomes a dark gold colour. Take great care not to let it burn. Leave it to cool a little. Sieve the flour and sugar into a large mixing bowl, then add the ground almonds. Add the lemon zest. Beat the egg whites to a soft foam – they shouldn't be able to stand up. Make a well in the centre of the dry ingredients then pour in the egg whites and the melted butter. Mix lightly but thoroughly, then pour into the buttered tins. Roughly chop the raspberries and drop into the tins. Bake for 10-15 minutes, remove from oven, then leave to settle before carefully removing from the tins with a palette knife. (Adapted from a Nigel Slater recipe).